– A young man touches a young woman’s arm and face and they kiss. ► A young woman opens her chest covering and pulls out a mechanical heart with tubes attached to it and hands it to a young man who tells her to put it back (she does). A young woman asks a man if a human can fall in love with a cyborg. ► A woman is shown reclining in a bed and wearing stockings with garters and a sheer bodysuit (we see bare upper thighs to hips and flesh tones through the sheer fabric) while talking to a man in the room (a relationship is implied). A shirtless young man sleeps in bed; we see his bare chest, abdomen and back. A female cyborg has a feminine form with bumps at the breasts, curves at the waist and hips without detail; a second “body” has slightly more developed breasts and a male cyborg’s suit is form-fitting and accentuates his buttocks. A woman wears a short dress that reveals her fishnet stocking-covered legs and garters. A young woman wears a tight-fitting top that accentuates her breasts. - Cyborgs are shown with a variety of components, some larger than others, with some having mostly metal frameworks and some having some skin covering their faces and parts of their bodies; some have weapons attached to them. ► Two young men attack a man and pull parts off his body (we see him on the ground unable to move); they are interrupted by another young man and two of them argue and punch each other until a man with a sword attacks them and pokes one in the shoulder with a pointed metal finger (we see blood) and then slashes the other in half with the sword (we see the pieces fall to the ground separately and a bit of blood is shown). A cyborg stabs a young man in the abdomen (we see a lot of blood on the wound and his hands). A young woman stabs a man in the chest and he falls dead (we see blood on the wound and it pools under him). A man loads a large weapon in a dark alley where a woman approaches him and he is interrupted by a young woman; they are both surrounded by a male cyborg, the woman and a giant cyborg and the man fight with the male cyborg, cutting off his arm and the young woman attacks him punching him repeatedly while on the ground (we hear the blows); the woman attacks with long blades (she says, "I want to rip you open to see if you're ugly inside") and the young woman kicks her hard in the head pinning her to a wall and her body falls to the ground leaving the head stuck into the wall (we see "blue blood"); the giant cyborg holds the first man by the face and tells him to "watch her die" and the young woman kicks his arm off and uses a weapon to push him away. A man is attacked in the street, he is clotheslined by two men on motorcycles, he is cattle-prodded and his arm (it's mechanized) is removed as he screams, and he is left on the street with a man as he lights a torch gun and we hear the man scream again as the scene ends. A large cyborg enters a bar and shoots a weapon through the chest of a man (we see a hole in his chest as he falls to the floor dead). ► A young woman is chased by cyborgs and one falls from a pipe high in the sky, they swing from cables, and the young woman is snagged by a chain and pulled toward a cyborg that she fights and cuts in half; another cyborg is pulled into a grinder machine and we hear him scream until he is crushed. A young woman cuts the face off a cyborg and we see machine parts inside as he yells. A young woman is stabbed by a large cyborg's weapon (she regenerates instantly), she slashes the weapons off the cyborg's arm, and then cuts him vertically from head to legs and we see him fall apart. A young woman jumps through a hole in a floor to chase a large cyborg and they fight in a cavern below where she flips in the air and pulls out one of his arms; he shoots a weapon that has bladed cables and knives at the end and she tries to evade them, eventually being cut to pieces and we see her body fall apart on the ground; she then pulls herself on the ground and throws herself into the air to punch the cyborg in the eye, breaking off part of her arm in the socket. A young woman fights many cyborgs in a bar with kicks and punches. A young woman insults a cyborg and he grabs her, she slams him into a table, he draws a sword and she kicks him into a wall (we see blue blood coming from his nose). A cyborg in a bar beats up several other cyborgs and slams them into tables. Several cyborg dogs attack a large cyborg and he runs into a cave to escape them. ► A young man is caught in a spinning blade on a pipe high in the sky and is cut to pieces (we see the pieces thrown in the air); a young woman catches his head and the torso piece and holds onto him until his arm breaks (it's mechanical) and he falls out of sight. A man opens a large case that contains a woman's preserved severed hands, eyes, brain and beating heart. A flashback shows several young woman shooting at a spinning blade as it approaches them and they are cut to pieces and thrown in a cloud of dust. A young woman smears a dead dog's blood on her face and says, "I do not stand by in the presence of evil." ► A dog barks at a large cyborg and the cyborg kills it (we do not see the act but we see a pool of blood on the floor later). A woman in a dark alley is startled by a cat jumping on a trash can; she turns and screams and we see the shadow of a blade being raised over her and hear the sound of a metal slicing (she is killed, but we do not see anything). We hear that a girl was murdered by a patient looking for drugs in a laboratory and we see a flashback to a man throwing things around the lab in a rage, throwing a man into a table and charging toward a girl in a wheelchair; she screams and we see the wheelchair overturned as the angry man storms out. 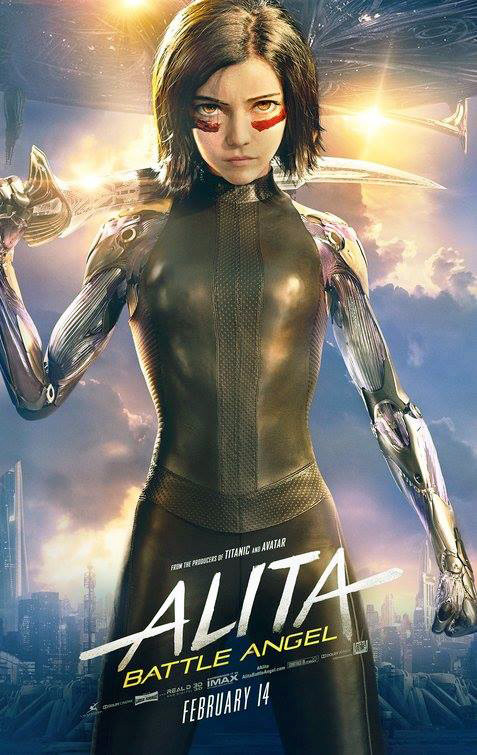 A young woman is shot at by many giant security robots; she dodges the bullets and cuts them with a sword shorting them out and cutting off pieces; she then uses a gun from one of them to shoot another security mechanism. A flashback scene shows a battle sequence on a planet's surface with people exchanging gunfire and fighting. ► A large cyborg crashes through an apartment window and lands on the floor, injured (we see that he is missing an arm and a woman inside the apartment is startled). A giant robot moves through a street and a young man pulls a young woman out of its way; she then dives back under the robot's massive legs to retrieve a dog and takes it back to safety. A young woman is nearly run over by a vehicle. A young woman pounds on a metal table in anger and dents it. Several cyborg dogs growl in a bar. ► A TV shows the action of a game where cyborgs speed on a track and chase a ball (referred to as motorball). A motorball tryout pits several cyborgs against a young woman and they use weapons to try to injure her: she knocks several down, one crashes into a pole and breaks apart, one blows up, one's head rolls on the track and he mouths an expletive, and the young woman breaks the arm off another and slams it into the neck of another before jumping through a lighted billboard and skating along tubes while being chased by the remaining players. Several people on motorized rollerblades speed over ramps and jump with a ball; a young woman tries it for the first time and slams into a sign (she falls but is uninjured), another player shoves her and she falls and hits the ground hard (she is unharmed), and she flips that player and takes the ball (he is shown on the ground but no visible injuries). A motorball match is shown with cyborgs speeding around a track and crashing into each other; sparks fly, and a cyborg is torn apart by a weapon. A young man steps off the edge of a roof and onto a large antenna, and then back onto the roof where he and a young woman sit. A young woman practices fighting techniques in front of a mirror. A large cyborg pounds and kicks equipment in anger. ► A flyer describes a person wanted for murdering 6 women. A woman confronts a man and accuses him of "Using your daughter's body," and he says, "Our daughter's dead." We hear that guns are outlawed in a city. A man says that he no longer wants to "make monsters." A man identifies himself as a "Hunter Warrior." A man tells a young woman to wait outside and "Don't kill anyone." A woman touches a young woman's arm and the young woman pulls away and asks, "What's your problem?" We hear about a war with Mars. A man offers cyborgs money to kill a young woman. ► A large cyborg is shown being repaired and his head, torso and spinal column hover over a mechanized body. A man carries the head and torso of a cyborg after a fight. A severed head is placed on a table (we see wiring and blue blood at the neck). A man is shown with a cut on his sleeve and blood drips down his hand. A man in a medical office is shown missing his limbs (wires stick out of the sockets) and he talks about being attacked and that they tore him apart. A man in a medical office repairs a man's robotic arm. Several scenes show rubble falling in the distance from a "sky city." A man rummages through a landfill for parts; he picks up a metallic skull and pulls out the eye (there's no blood or gore) and finds a head and torso with skin (we see mechanical bits and wiring under the skin and a spinal column dangles out) that he scans and says, "You're alive." A young woman jumps into a lake and walks on the lake bed into a crashed vessel where we see a skeleton in a command seat and the lights inside the vessel begin to flicker on. A young man is shown on a medical table with monitors and tubes. ► A young woman bites into an orange and spits it out and makes a face (she ate the rind). A woman is shown with a gem in her forehead. - We see medicine vials in a drug cabinet as a man tears through it and steals the drugs. Several people in a bar are shown with alcoholic beverages, and two men drink from glasses of alcohol. - War, magic, evil, greed, trust, connections, technological advancements, failure, morality, guilt, control, power, memories, goals, reams, love, rules. - Who you really are can be found in your heart.